Diet.com has a comprehensive range of tools to help you lose weight and feel great. With tracking and monitoring features, a huge variety of recipes, meal and exercise plans, workout videos, online support and consultations with professionals, it has almost all bases covered. The site’s an old favorite of ours, winning top spot previously, and it comes roaring into first place yet again. The reason is that it covers so many weight loss criteria, whilst also remaining user friendly and affordable. Whilst some sites focus on diet, others focus more on exercise, but very few manage to get the balance right. Diet.com provides a wealth of expert knowledge for anyone, with so many community features that you will never feel alone in the dark. We’ve all been there: the old jeans aren’t quite as loose as they used to be. That favorite sweater isn’t sitting how we’d like it. The fact is, in today’s world of convenience and excess, it’s easy to put on weight. Going to the gym isn’t for everyone, and most of us could probably benefit from eating more healthily. Dieting isn’t all about body image, it's also about our internal health, improving how our bodies work and making sure we’re getting the nutrients and exercise we need to function well. Diet.com seems to understand this, providing all sorts of information and support for its members. There are four key elements to consider here: diet features, fitness features, support, and value for money. Diet.com provides diet plans, calorie counters, recipes, nutritional information, tips and videos to help you eat healthily. That’s a lot to go through in such a short space, but we’ll focus on the highlights. Meal plans provide a pre-designed selection of breakfast, lunch and dinner options for a set amount of time. The site supplies samples for 3 days, including regular calorie-controlled plans, vegetarian plans and gluten free plans. You’ll also find that it caters to low carb, nut free, pescatarian diets and more, so you ought to be in good hands, whatever you can/cannot eat. Calorie counters and nutritional data is provided so that you can make sure the invisible content (nutrients) of your food is appropriate. You may even wish to alter your meals to incorporate more of one nutrient if it’s lacking elsewhere. You can read nutrition expert blogs on a range of interesting topics to help supplement any diet changes and make sure these adaptations are suitable for you. Users can upload their own recipes as well as accessing a large number of those already online. You can also include recipe videos to show everyone a particular technique or how the final product should appear. Similarly, you could watch videos of other recipes, which have been uploaded by other members. This is a great way to get involved in the community, and it’s something you rarely find elsewhere. 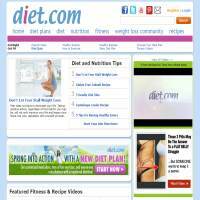 Diet.com offers an impressive range of diet and fitness features, with good support, all for a reasonable price. The fitness section of the site is a little smaller but still has plenty to provide. You can find articles, challenges, blog posts and more. Fitness tools include a workout builder (allowing you to mix and match exercises, rearranging them to build our own workouts) or watch videos of exercises being performed safely. Expert fitness tips are provided to support you, as well as an online weight tracker to help you monitor your progress. The fitness videos are a really useful addition because it can be hard to properly picture an exercise by simply reading about it. It’s also a great motivator to see the experts in action, who talk you through each element of the workout. You can find out which videos are most popular and even rate each video. This helps other users to understand which videos are useful and which might be less engaging. In terms of support, Diet.com is hard to beat. You can access tips from experts or even arrange to receive online coaching from professional dietitians. The majority of the top rated exercise videos are performed by professionals, with really detailed explanations of the movements and benefits. If you need any additional help, the customer services team is also there for you. Support is also provided by the online community, who are active on forums, uploading recipes and comments, photos and more. The forums are a space for you to mingle, share thoughts and make friends. If you’re ever in need of a shoulder to lean on, there’s always someone there who’s willing to listen and help you through your weight loss plan. Remember, the people in these forums are on Diet.com because they want to lose weight too, so they have a lot of experience which could come in handy. Diet.com isn’t completely free, but there is a lot of free content on the site if you sign up as a basic member, including more than 1000 recipes and the ability to read tips and blog posts. You can also use diet and fitness tracking tools at no cost. Upgrading to premium membership allows you to customize your various plans and receive online coaching, whilst also opening up a few more opportunities around the site. The 6 month plan, in particular, offers excellent value for money. So, all things considered, Diet.com offers an impressive range of diet and fitness features, with good support, all for a reasonable price. It therefore takes the No. 1 position in our category of Weight Loss Programs. Why not take a look for yourself and see what you think? It should have something for anyone who wishes to lose some weight and feel healthier, whatever the budget.